When I originally thought about organizing a "fed is best" type session, I was hoping to find at least 4-6 mamas willing to model with their babies. Instead, I had over 30. Thirty mamas wanting to capture the precious moments of feeding their babies, breast or bottle. If you are a parent, you know how fast this time goes. I do not have any children yet, but I do have a passion for families and relationships. I know first-hand how important it is having those memories captured later on in life. I so wish I had more photos of me and my mother! I can't even say how much I would appreciate that. With summertime being so busy, we ended with up 8 moms and babies, and I am so glad it was more intimate. The weather was perfect on both days, and the babies were so cute! I am very thankful to live in an area that is so birth-friendly. With birth centers, mom groups, breastfeeding classes, more groups, and businesses that are accepting of breastfeeding in public. It is disappointing that it's even something to BE excited about, because it should just be normal, but it isn't. There is still so much growth that needs to happen to have breastfeeding normalized, AND to have "fed is best" be equally accepted. To keep this short, educate yourself, be kind, accepting, and SUPPORTIVE. As a birth photographer, I LOVE getting to meet new mamas and their babies.. because well, I love babies, and it is so fun to capture this part of motherhood. I spend a lot of time with moms before their babies are born, and shortly after, and it was great to spend time with some "older" babies. 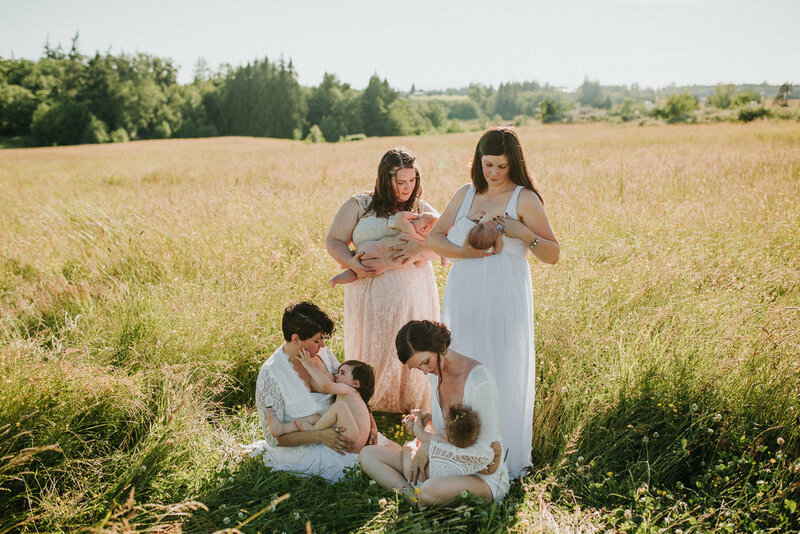 I am so excited that Bellingham is growing, in that it is becoming more common to have a birth photographer. I am getting less "You photograph birth, like the baby coming out?!" responses, and more moms saying they wish they had those moments captured. This is exciting for me, and makes me want to have WAY more sessions like this Fed is Best event. Knowing that my passion is with birth, babies, and families, I want to dive more into that, and find creative ways to offer these types of sessions. I could go on and on about this all day, so I will leave it here. Enjoy the photos of these beautiful mamas and babies!